Encounter freedom in the unlimited horizon as your Turtle Airways seaplane traverses the majestic Fijian skies on the way to Paradise Cove Resort. After you land and step from your plane, you have left behind the trappings and stresses of modern life and entered into a realm of authentic island friendship and hospitality. Paradise Cove Fiji offers an array of unique activities designed to immerse visitors in the world of the locals, their culture and heritage. Treat your senses to the song and dance of a traditional cultural show (Meke) presented by the staff, or take a day trip exploring the villages of Naviti or Waya Island (guests can even take a guided hike to the top of Waya’s highest peak). Partake in a traditional Fiji Kava ceremony, or, during winter, cheer for the local village rugby team or snorkel and dive with giant manta rays. You can even bear witness to the wonderfully quirky spectacle of crab racing on the beach at night, or relax and watch a movie on the big screen under the stars. Hidden away in a sheltered bay on Naukacuvu Island, Paradise Cove is the Yasawa Islands’ secret that guests simply cannot keep to themselves. Family, friends, and online readers, all now know about this 5-star resort and its unforgettable island experience. Here, all the boxes are ticked for the ultimate island vacation: perfect beaches, sparkling water, lush tropical gardens, and serious relaxation. 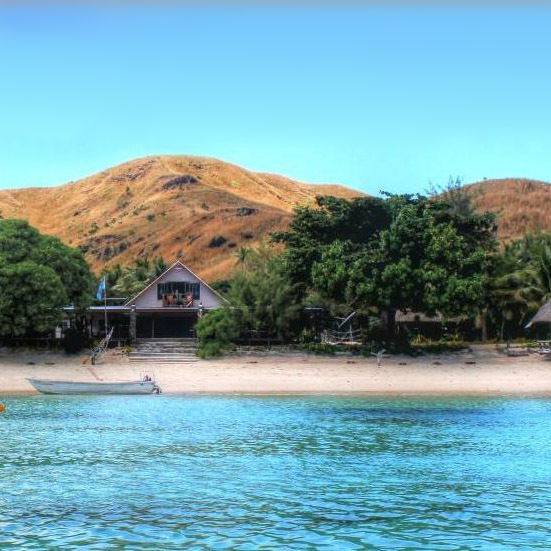 Above all else, Paradise Cove Resort Fiji is known the world over for the exceptional dining experience it offers. Guests concerned that only one restaurant might not provide enough variety are soon blown away by the range and quality of food to be savoured at Black Rock restaurant, where locally-sourced, seasonal fare is transformed into mouth-watering Fiji specialties. Freshly-caught seafood and tropical resort-grown fruits are the stars of an exciting and ever-changing menu. In the evening, guests can relax after dinner with a cocktail and watch the sun set through the palms while the island band entertains with Fijian serenade. Food becomes the highlight of the entire Fiji visit for guest after guest at Pacific Cove, with many Tripadvisor reviews singing the praises of the Black Rock and saying that it would not be out of place among the fine-dining restaurant precincts of major international cities. Many foodies will now automatically bypass the unexceptional mainland hotels, having become loyal repeat visitors to Naukacuvu Island! 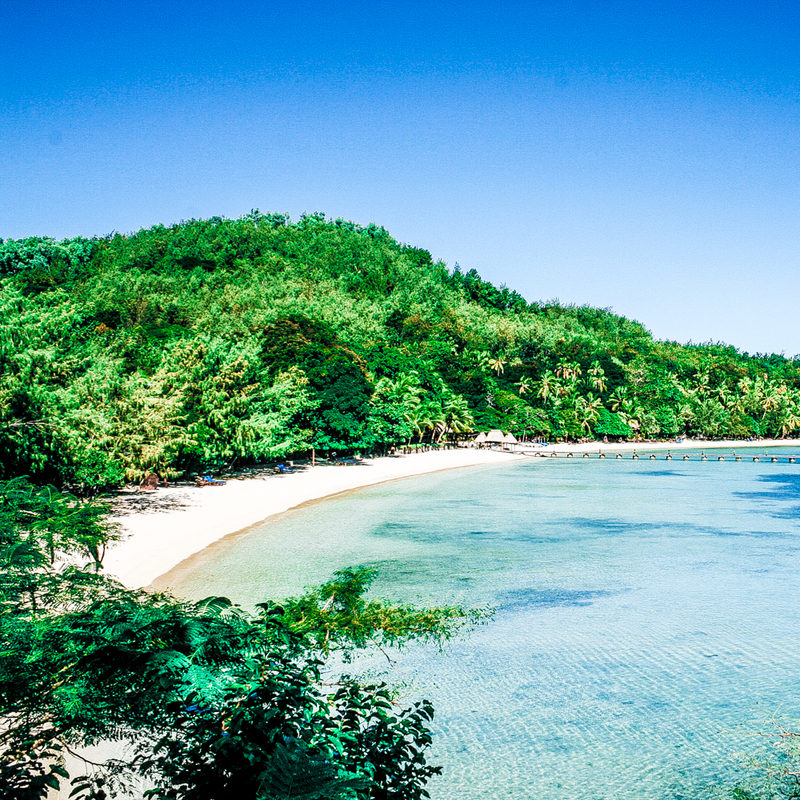 Besides food, Paradise Cove Resort is equally as well-regarded for its water activities. The team at the PADI dive shop have gained a well-deserved reputation as patient and caring teachers and guides. First-time divers are in good hands, benefitting from thoughtful and attentive tuition, and veteran divers can enjoy a wide range of dive package deals, exploring world-class dive sites. The opportunity to discover the beautiful coral gardens of the Yasawa Islands has never been better. Friendly dive shop staff can also help organise kayaking, game fishing, paddle boarding, and snorkeling. Countless guest reviews speak of the wonderful convenience of direct oceanfront access, and being able to snorkel right off the resort beach. Nearby (just a 10 minute boat trip), guests have a once-in-a-lifetime opportunity to swim with manta rays and watch these gentle giants gliding around their feeding grounds between the months of May and October. Natural wonders abound in the Yasawas, you might even be lucky enough to see newly-hatched baby turtles barrelling their way to the water by full-moon. Accommodation options for couples includes bungalows overlooking, or situated in, tropical gardens, luxurious beachfront villas, and one-bedroom garden villas in an Adults-only zone with two of its own pools. Couples looking for the ideal honeymoon stay, or a romantic escape, will love the private plunge pool and hanging day beds of the honeymoon suites. With beachfront and garden options, the family villas provide lots of room for larger families, carefully designed to be functionally practical without compromising on comfort. And for the ultimate in luxury, there are two private, Adults-only, luxury beach villas (with one and two bedroom options), located on a private beach away from the main resort. Situated to look across the water and take in the setting sun, guests will love having a tropical island platter delivered for breakfast, and having their own boatman ready to take them to the main resort. All rooms feature air-conditioning, free in-room WiFi, an outdoor balcony, room safe, and television. Visitors should enquire about the much-talked-about outdoor showers. Guests speak of reluctance turning to ecstasy as they watch the stars sparkle at night from their open-air shower. Guests worried that the stunning pictures online won’t match the reality when they arrive can rest assured – they do! It’s as good as the Tripadvisor reviews say, with natural beauty in every direction to overwhelm the senses, and always with the dependably temperate Fijian weather. A guest highlight is having the backdrop of another island just across the channel from the resort, and the quiet remoteness of the surroundings. Doing absolutely nothing all day on a sun lounger is heartily encouraged at Paradise Cove, but there is so much to do and see that active relaxers will feel right at home. Start the day with a beach walk at sunrise, then try an energising yoga class. Take a guided hike to the top of the highest peaks of the Waya Islands and enjoy amazing views of the whole island chain. Fish by hand-line at sunset or watch an outdoor movie under the stars in the evening. From the moment guests arrive, they are introduced to traditional Fijian life, with a Kava ceremony held in welcome. A traditional Fijian cultural show (Meke) is held every Friday night to give guests a further taste of life as a local, with singing, dancing and fun that often becomes a guest trip highlight. Paradise Cove isn’t just ideally suited for couples. Kids will love their time here too, not just because of the superb kids club activities but also because of how good the staff are with the children. Guests often observe how wonderfully attentive and caring the staff are towards their children, and how they are made to feel like family during their stay. A resort like Paradise Cove deserves as much time as you can possibly spend there, and a seaplane transfer is the best possible way to ensure this, avoiding 5 and a half hour boat trips each way. 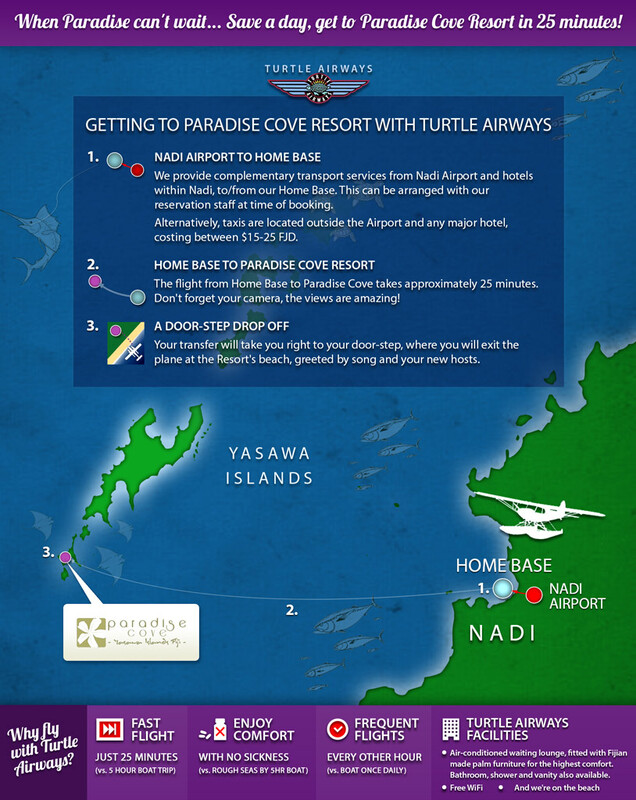 Turtle Airways will take you directly from Nadi and land you right on the shore at Paradise Cove. Sometimes a different landing zone is necessary because of the effective degree of shelter, but Turtle Airways coordinates with Paradise Cove Resort to ensure an easy transfer, whatever the weather.